Are you using IE7 and felt that web page loading is quite slow compare with IE6 ?Below having few tips that can help you to made your IE7 web page quick loaded. Microsoft released a update ( KB 928089 ) resolves a performance issue with the Phishing Filter. When visiting certain web pages, the Phishing Filter may increase CPU usage while evaluating the page contents and the system may become slow to respond and loading slowly. Please visit Microsoft website download KB928089 update. 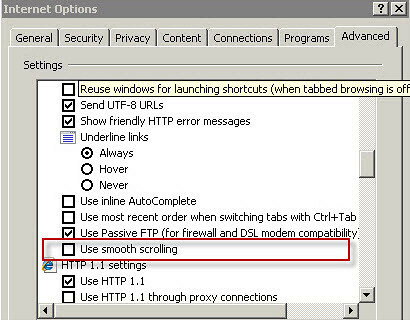 Open up IE7 web browser,then select ‘Tool’ and ‘Internet Options’. Then selected ‘Advance’ and scroll down to ‘Underline links’ item,put uncheck ‘use smooth scrolling‘. 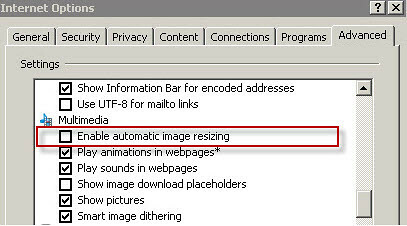 Then scroll down again to ‘Multimedia’ item,put uncheck again to ‘Unable automatic image resizing’ . After completed all the setting above,you need to restart IE7. How is it ? Is it loading quickly ? If you have another tips how to made IE7 loading quickly,please share with us.